We found Rufus is dropping slaver again. I don’t understand why the slaver come out — and sometime stop. I applied chi and gave orange juice with royal jelly. 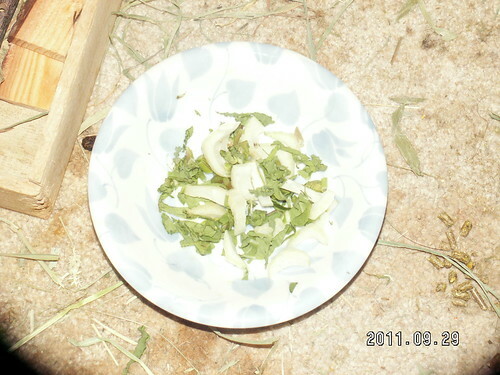 It’s still good I don’t feel he is getting weak, and today he ate small amount of chopped vegetables! He is munching a strip of chopped vegetable, which he couldn’t do a week ago. I hope he is still getting better. The chopped vegetables are bok-choy and turnip green. He ate a lot of vegetables! You may feel headache again, because I loosened your 2nd cervical spine and now you may have more blood stream to your head, but your bones of skull are still closing tightly. If you feel headache, please put a microwaved wet towel (wrapped with a plastic bag and dry towel) on top of your head. Occipital region of head may work too, as well as on your eyes. Seitai masters know there is an order to make loosen human’s body, but I didn’t think well about the order last night. I’m sorry, I need to study more! !